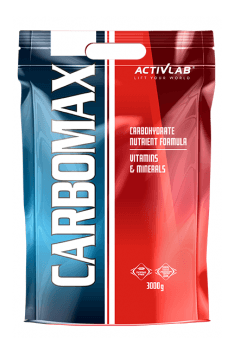 Carbomax Energy Power is an ideal source of energy recommended in sports requiring heavy physical strain and a lot of endurance such as cycling or running. It provides a systematic and lasting supply of energy needed during intensive physical exercises. Glucose is absorbed very quickly and gives energy immediately after consumption and maltodextrins deliver energy gradually in later phase. Carbomax Energy Power maintains regular level of glucose in blood that retards strain symptoms. It is enriched with well-balanced amount of mineral ingredients such as sodium, potassium, calcium and magnesium which, when delivered during physical exercise, effectively supplement lost electrolytes and are responsible for proper muscle contraction. Carbomax Energy Power Dynamic reduces the feeling of weariness and strain caused by physical exercises and helps to fight crisis during intensive trainings. Dissolve 1 scoop (30g) in 200 ml of water. Preferably use before and after physical exercise. Dissolve 1 scoop (30g) in 200 ml of water. Use 1-2 times a day. Use according to individual deficiencies in the diet. This supplement should be used to fill in for the lack of carbohydrates in the diet. Best results can be reached by using immediately after workout. Maltodextrin, acidity regulator - citric acid, flavors, sweetener E951, vitamins (L-ascorbic acid, nicotinic acid amide, DL-alpha-tocopheryl acetate, retinyl acetate, cholecalciferol, calcium D-pantothenate, pyridoxine hydrochloride, riboflavin, thiamine mononitrate, pteroylmonoglutamic acid, D-biotin, phylloquinone, cyanocobalamin), mineral components (ferrous sulphate, zinc sulfate, copper sulfate, manganese sulfate, potassium iodide, sodium selenite, sodium molybdate, chromium (III) chloride), red beet (black currant flavor) ), coloring: E133 (blackcurrant and kiwi flavor), E124 (strawberry, cherry and grapefruit flavor), E110 (kiwi flavor, orange and grapefruit).